Good. 0395292034 1941 EDITION WITH DJ, COVER DIFFERS. Very Good. 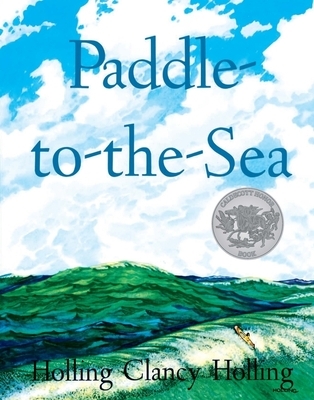 Paddle to Sea by Holling, C. Holling, 1980-02-19. Picture book. Sewn binding. Cloth over boards. 64 p. Contains: Illustrations. Intended for a juvenile audience. Holling Clancy Holling. Very Good/Fair. 4to-over 9¾"-12" tall re-print 18th printing, inscription to front end page, scuffed jacket edges, split to spine edge top and section missing to 3cm and bottom edge to 1cm section, top corner edge split to 4cm front and several smaller splits. New. Picture book. Sewn binding. Cloth over boards. 64 p. Contains: Illustrations. Intended for a juvenile audience. I purchase this book for every new parent I am in a position to buy a gift for. The book teaches about the biology and geography of the Great Lakes using a canoe made by a young Indian boy (Native American/Native Canadian/Canada's First People). The artwork is the solid realistic illustration found in mid-twentieth century American books, The large realistic drawings are offset by simple almost whimsical pencil sketches of ways to think about the operation of the Great Lakes or the forests and swamps, saw mills, locks, fishing boats along the shores. Holling Clancy Holling's books are always good, but this one is my favorite and as such I share it with every family I get to know. This is one of the greatest childrens books of all time. Wonderful poignant story with the greatest illustrations. This is not just a story but a geography lesson not to be forgotten. Marvelous well told tale, a delight! This marvelous book written and published long ago is simply one of the best adventure books for a young child, beautifully told and illustrated, it remains a favorite memory for my children. Over the years I have presented it to several special children of my family. Every so often I take out our old copy and read it myself - just for the pleasure of experiencing it over again, just as when I first read it to my youngest son. My son's second grade teacher read this book to his class 23 years ago. He excitedly told me about it. Since then, I have read it to dozens of other children in my classes. They all love it. It tells a wonderful story, has incredible illustrations and great maps. The story takes place in and around the Great Lakes. It's a great geography lesson too. Each page is one chapter and it is a great book to read for just a few minutes everyday. Get this book, you will love it and read it again and again! It is one of my all time favorites. The ending is so perfect, but read the whole book, don't peek! The author has several other books that are equally as good. I have bought them all.